F G Davis, a selection of recent work. RECENT WORK. 2011 to 2018. This section shows some of my seminal pieces completed in the last few years. I have included some short additional comments to give you more information about the processes I used and occasionally some insight into the ideas and sources of inspiration which led to the work. Watch these spaces to see all the latest paintings and for information on forthcoming exhibitions featuring the work of F G Davis. Coffee Sack Series No. 11. An exhibition of 18 works from my Coffee Sack Series ,( 2015-18) ,will be on display at The Words and Pictures Gallery, Teignmouth Devon, from 5th to 18th May 2018. I opened an exhibition of The Devon Art Society at Lupton House, Brixham, the other day. This piece was donated to raise funds for them as well as for 'NIGHTSTOP', a local Charity helping young homeless people aged 18 to 25 by providing them with a bed for the night. A worthy cause I feel. 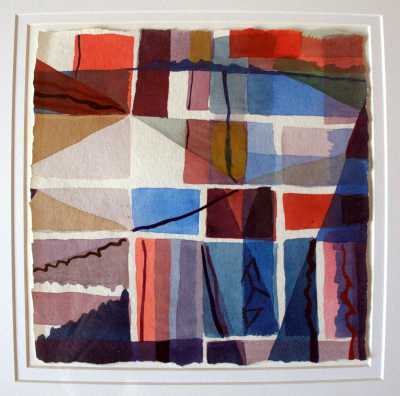 A watercolour from 2015 on show at The Kitchen Gallery, Cockington Court. I have worked in watercoulour and gouache since the mid 1960s and always enjoy the way the overlay of areas of colour can create subtle atmospheric affects. This piece will be exhibited at The St Ives Society of Artists, Mariners Gallery from 25th Nov. 2017 to 2nd Jan. 2018. Mixed Media on Canvas. 2018. 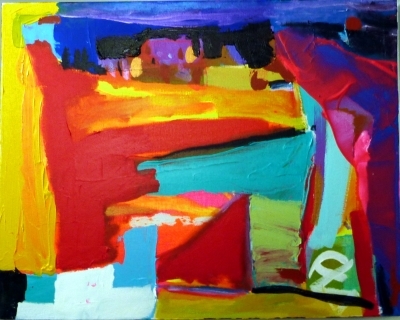 Exhibited at The Penwith Gallery, St Ives. Members and Associates Show. Nov. 17 to Jan 6th 2018. A homage to the Aboriginal artist, Sally Gabori. I saw her work in Australia in Feb. 2017. A brilliant colourist who used her experience of lanscape to produce stunning work. BUILDING BLOCKS. Watercolour on Handmade paper. A watercolour miniature, one of five exhibited in an international show in Brittany, France in 2013. RONDEZ-VOUS in AMBOISE. Acrylic on Canvas. 2014. This piece is framed in an antique frame purchased in Amboise, France. SOLD. Private Collection. THE GOD OF INDONESIAN COFFEE. Mixed Media on Canvas. 2015. A UNIVERSE OF EMERGING THINGS. Mixed Media on Canvas. 2015. Mixed Media is used here to accentuate texture. RED RUM. Mixed Media on Canvas. 24 x 24 inch. 2015. 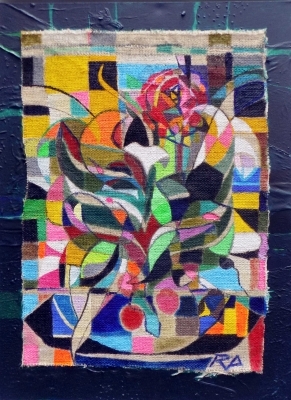 Last exhibited at The St Ives Society of Artists Spring Show, 2015. 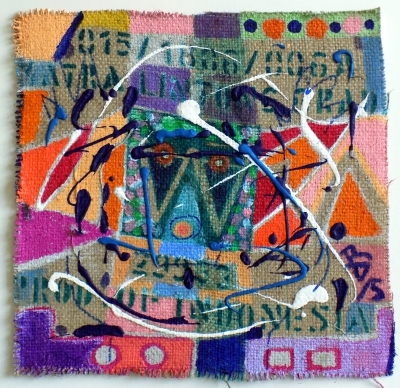 This piece incorporates a champagne label in the collage, which gave the piece its title. SOLD. 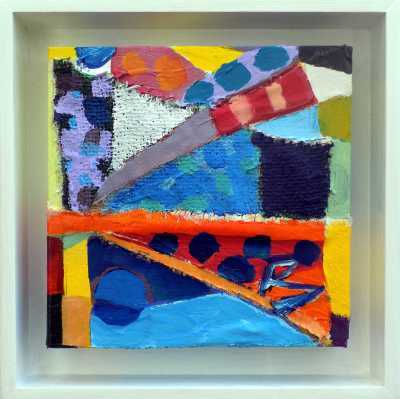 This piece is 20 x 20 x 4cm and is shown framed. This piece is shown framed. The inspiration was the study of butterfly wing patterns. A piece was completed as a special commission in 2015. Private Collection, Sat Bains, Nottingham. TOUCH THE SKY. Mixed Media on Canvas. 60 x 60 x 4 cm. 2012. 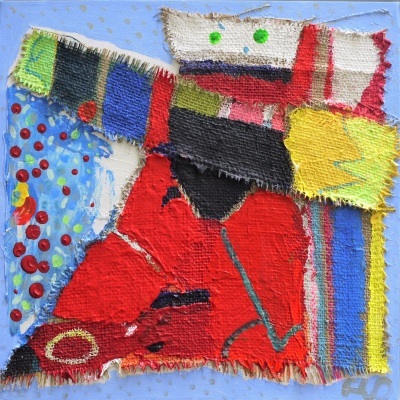 A heavily textured using layers of calico and cotton An emotional and expressive image with a cutting edge. RESCUE ME. Mixed Media on Canvas. 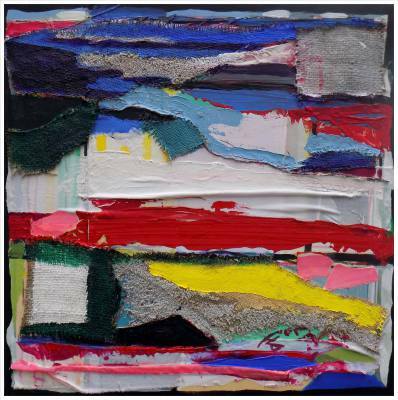 60 x 60 cm. 2011. This piece is now on show at Galleria St Ives Gallery. 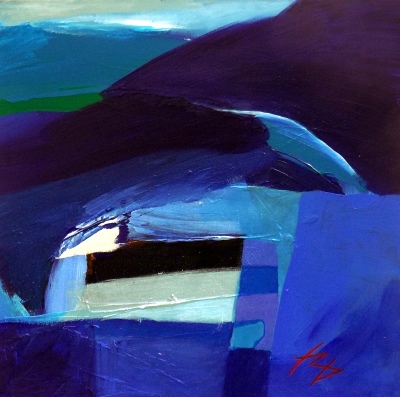 First shown in the 'Into the Blue' mixed exhibition at The Artizan Gallery, Torquay. Inspired by my visits to Trebarwith Strand, Cornwall. SOLD. Private Collection Devon. THE HARBOUR. Mixed Media on Canvas. 100 x 80 cm. 2015. This work was exhibited in the second T.Q. 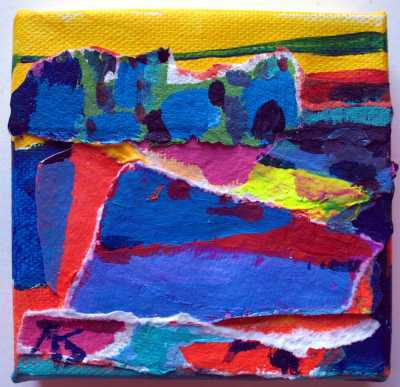 group exhibition at The Crypt Gallery. St Ives Society of Artists, in May 2015. STAY IN THE WARM TODAY. Mixed Media on Canvas. 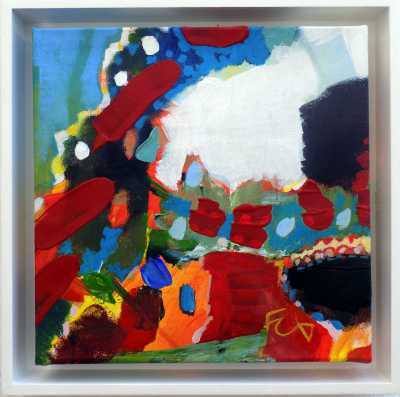 100x100 cm. A note from my wife written when I was ill., written on the last sheet of a Mickey Mouse Notepad, a present from my young daughter from a visit with her grandparents to Disneyland in Paris. Taking these personal memories and incorporating them in my art for me gives the piece meaning. 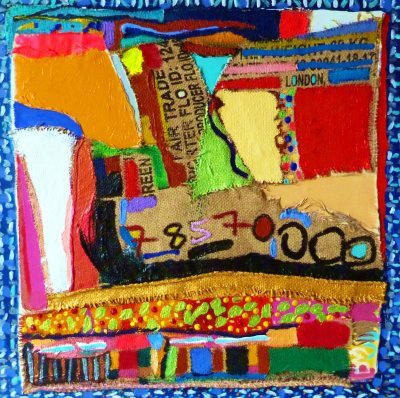 This piece uses a range of mixed media on Box Canvas.